Let’s face it, there’s a ton of crap out there you could spend your money on, and I’m the first to admit that I’ve fallen victim several times to the occasional buyer’s remorse-inducing purchase. Attempts are made daily not to contradict my desired minimalist approach to life and home design. I have every intention of becoming the ultimate conscious consumer – BUY LOCAL! SUPPORT SMALL BUSINESS! PRACTICE GREEN! I don’t drive a Prius. I am not a vegan. I wear real leather. I buy merchandise that’s made in China. And I don’t always eat organic. I do attempt to recycle every chance that I get and support buying second-hand (or “pre-loved”) goods. 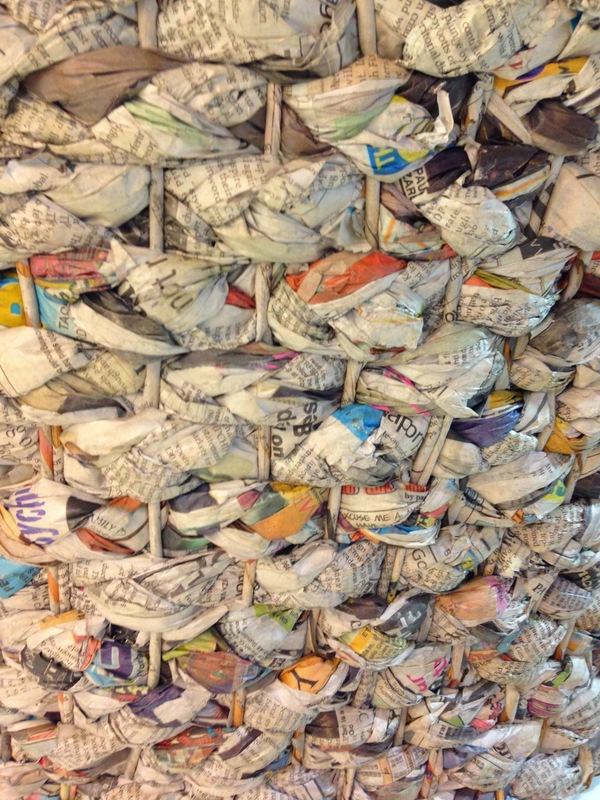 So when I discover items that are made with recycled materials, I dance the Happy Pickle. These baskets were sitting in a lonely corner at the rear of the TJ Maxx store where I spotted the Wishbone chair knock-off that I covered in an earlier post. 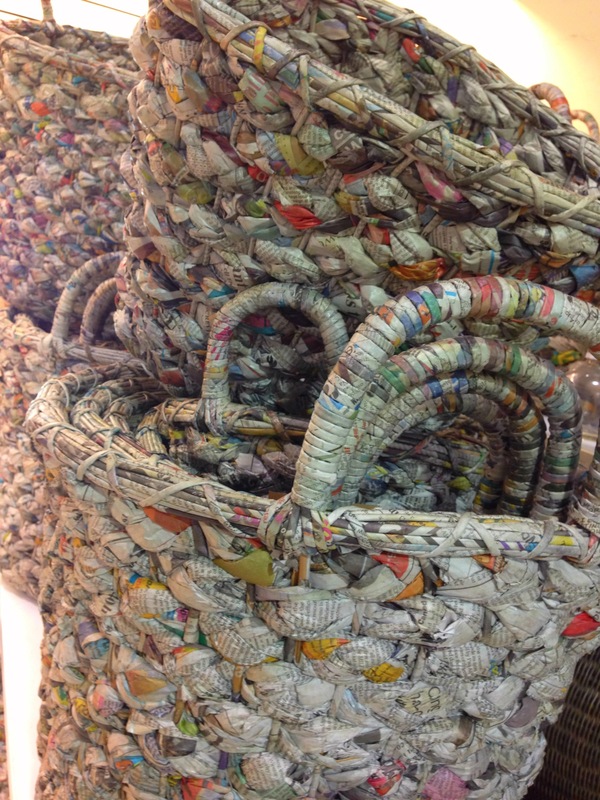 Upon closer inspection, I discovered that the baskets were made by tightly weaving newspapers together. They were designed by Danny Seo, an environmental lifestyle expert who has made it his mission in life to transform America entirely into a green-living country. 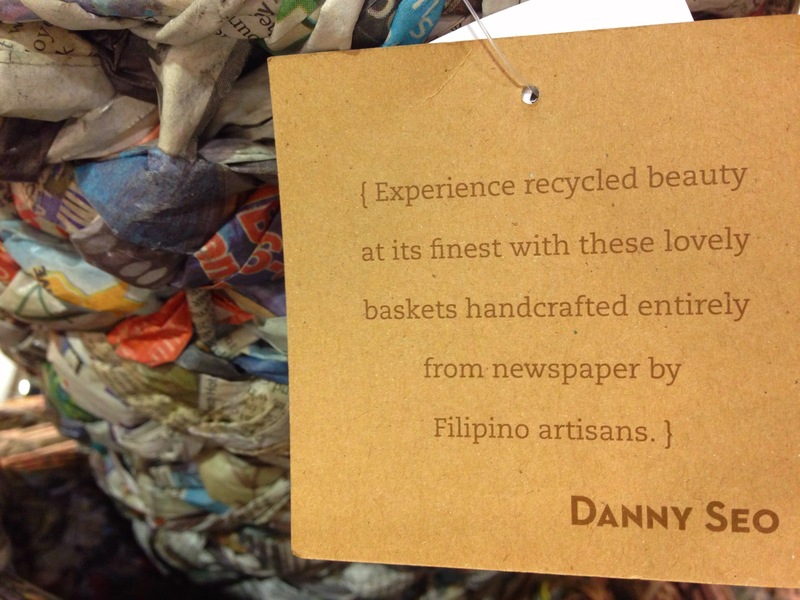 According to the product label, the baskets were handmade by artisans in the Philippines. I love the idea of turning trash into a useful and unique household item, while supporting a good cause. It’s similar to how Aid to Artisans is creating economic opportunities for people around the world living in marginal or at-risk conditions. Aid to Artisans has helped sell carefully crafted products through retailers like Crate & Barrel and Anthropologie (hot clothing alert!). So the next time you feel the urge to spend compulsively, consider buying something that supports a cause and contributes to the well-being of our environment. I’m not one to judge and I’m certainly not the type to push vegetable-oil-as-fuel doctrines in anyone’s face, but I love an opportunity that gives me the chance to make a difference — especially if it has anything to do with shopping.